Medics belong to the 1st Company, 15th Medical Battalion, 39th Rifle Regt., 13th Guards Rifle Div. Our job is to tend to the medical and hygienic needs of our tovarshi. We remain at the rear of a moving column or behind a firing line. We rush to the aid of the wounded and either bandage them so they can return to the fight, or remove them from the field of battle. 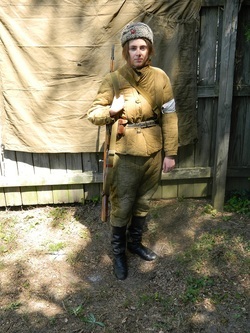 Medics – or sanitari/санитары– are just as active as the rest of the unit and add a greater sense of realism to battle reenactments. You must be in good physical condition to participate as a medic. Medics may carry any of the standard small arms and corresponding ammo pouch for personal defense and the protection of the wounded. I find the most convenient weapon to be a revolver or pistol. Not only is it lighter, but it frees you up to carry a "wounded" comrade's weapon while extracting him or her from the field of battle. Piping on the shoulder boards is red instead of raspberry. 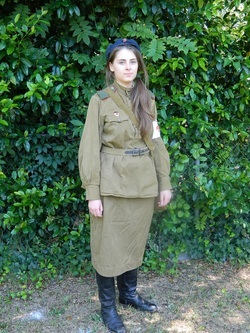 Female medics may wear either the pilotka (side cap) or the beret. 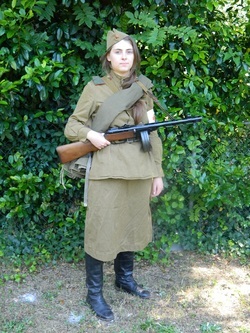 The beret can be either Soviet green/tan cotton or blue wool, and with a cap star as on the pilotka. 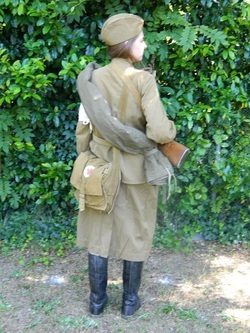 Female medics may wear the proper regulation skirt, although the sharovari (trousers) will prove more practical. All medics should purchase a translated copy of the 1939 Medic Manual, available here: http://www.amazon.com/Manual-Preparation-Medical-Personnel-Rkka/dp/149121824X/. If you are an active member of the group and have attended at least 2-3 events in the past year, contact me for a reduced price on this book. 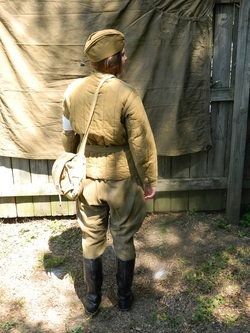 Each medic will carry a proper Soviet army medic bag. *Denotes items to be carried as they will prove useful at events. 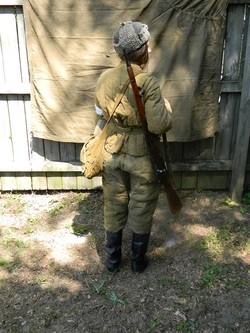 While the other items are not required, they are encouraged if you decide to participate in living history displays which are open to the public. 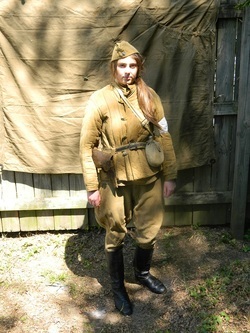 Medics are encouraged to add to the atmosphere and the general “feel” of the tacticals by making and carrying their own cloth bandages – both triangle style and long rectangular, plain and “bloody” – for bandaging the your “wounded” comrades during battle. These are made with plain white cotton fabric. You will learn to wrap the bandages in various configurations to simulate wound wraps. Another way we add realism to the fighting is to extract "wounded" comrades using authentic techniques. One technique is to lay the wounded on a plasch palatka and two to four medics carry him away. (The plasch may also be used by one medic to drag the wounded on the ground.) Another extraction techniques is the use of the medic's strap (or lyamka). the strap has many uses and every medic should endeavor to purchase at least one. The strap is best utilized by two medics, but can also be used solo if you are strong enough. These illustrations from the 1939 Medic Manual demonstrate how a comrade can be transported by use of 2 medics and one strap. This method of extraction utilizes both the plasch palatka and the lyamka. 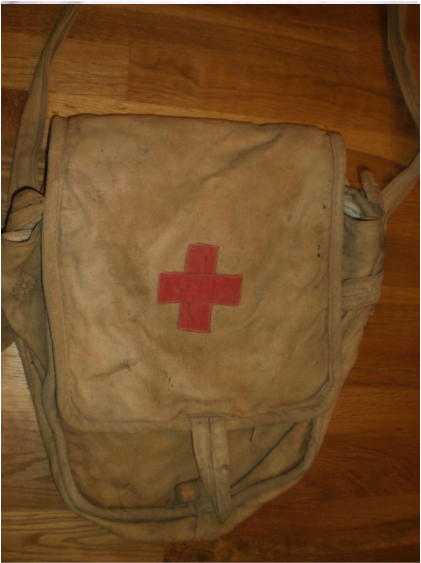 Medic's bag with contents from original medic's field manual. Notice there is a pockets for every item and every item is stored properly. Also note the bag's strap loops around the sides and bottom of the bag. This was a typical configuration of the time. Corners are rounded on the flap and the bottom of the bag. Medic bags from the 1960s and later have squared corners. Exterior seams are reinforced. Seams on medic bags from the 1960s and later do not have additional cloth or leather binding. The interior typically has pockets. The items mentioned above from the 1939 Medic Manual are intended to be placed in specific pockets in the bag that were numbered. Medic bags from the 1960s and later do not have interior pockets, only one on the outside of the bag just under the flap. 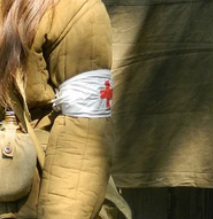 The red cross emblem on wartime bags can be sewn on (as in this example), painted over a white circle or square background, or may even lack a red cross. White circles outlined with red are an indication that the bag is not remotely correct for wartime. The flap closure on wartime bags is narrower than post-war ones. Fall season with pistol and pilotka field cap. This is what you will find yourself wearing most of the time. Armband to always be worn in the field unless ordered to remove. The bag is worn over the right shoulder and at the left hip. Medic of spring season...notice her shelter half roll to be used as protection from rain or it can used as a make shift stretcher in the field.